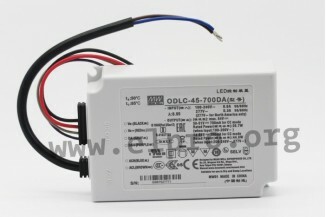 Flicker-free LED power supplies in a plastic case with constant current and DALI interface. 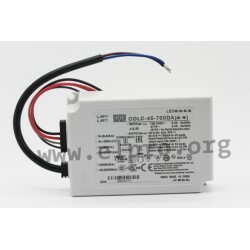 These devices have a built-in active PFC function, a short circuit protection (hiccup mode, re-power on) and are suited for LED lighting and moving sign applications. They conform to Insulation Class II and are in compliance with: EN61000-3-2, Class C, EN55015, EN61347-1, EN61347-2-13, EN61547. Our product range contains the following types of this series by Mean Well: ODLC-45-350DA, ODLC-45-500DA, ODLC-45-700DA ODLC-45-1050DA and ODLC-45-1400DA.